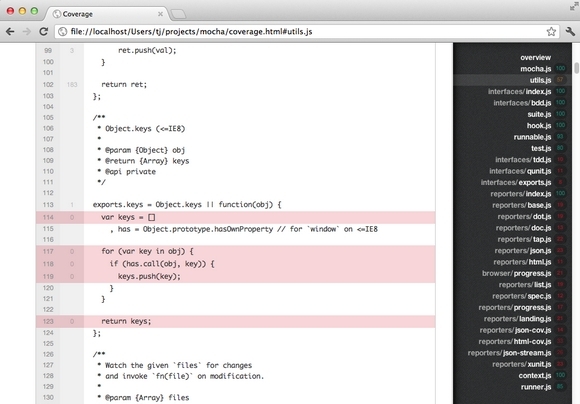 When testing synchronous code, omit the callback and Mocha will automatically continue on to the next test. Testing asynchronous code with Mocha could not be simpler. Simply invoke the callback when your test is complete. CodeMirror supports Autocompletion, Mode overlays, Search/replace, Code folding, HTML editor with preview, Auto-resizing editor, Setting breakpoints, Highlighting the current line, Highlighting selection matches, Theming, Stand-alone highlighting, Full-screen editing, Mode auto-changing, Visible tabs, Autoformatting of code, Emacs keybindings and Vim keybindings. 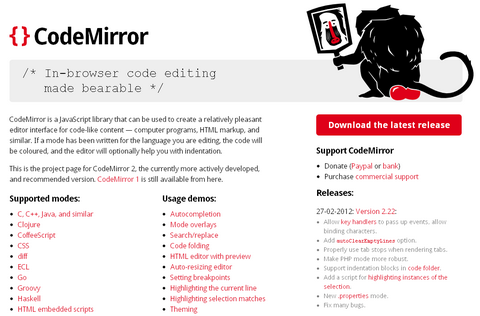 All of CodeMirror is released under a MIT-style license. To get it, you can download the latest release or the current development snapshot as zip files on GitHub. TypedJS uses a function’s type signature to generate input parameters, and evaluates the function upon these inputs to form a test case. This test case fails if an exception occurs, or the output violates function constraints. While type signatures provide a limited form of program specification, TypedJS adds a quick and rigorous sanity check to your deployment pipeline. This is just a start. 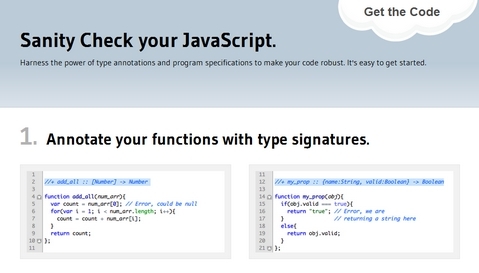 TypedJS will soon provide more complex forms of program specification, and analysis. It is licensed under MIT License. WebPutty is a simple CSS editing and hosting service, which gives you a syntax-highlighting CSS editor you can use from anywhere, the power of SCSS and Compass, a side-by-side preview pane, and instant publishing with minification, compression, and automatic cache control. You can see your changes instantly with the side-by-side preview pane, so there’s no need for the traditional back-and-forth between your editor and refreshing a browser to see your changes. 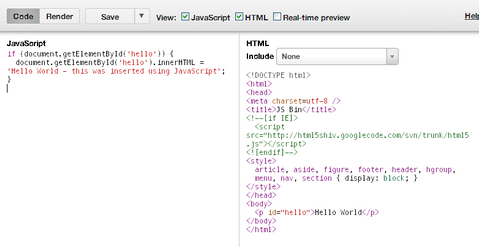 WebPutty also allows you to take advantage of SCSS and Compass. SCSS gives you expanded functionality and ease-of-use features like nested selectors, variables, and mixins, while Compass makes CSS3 features like box-shadow, border-radius, gradients, transforms, and transitions easier to implement by handling all the browser-specific prefixes for you. LESS extends CSS with dynamic behavior such as varibles, mixins, operations and functions. As an extension to CSS, LESS is not only backwards compatible with CSS, but the extra features it adds use existing CSS syntax. 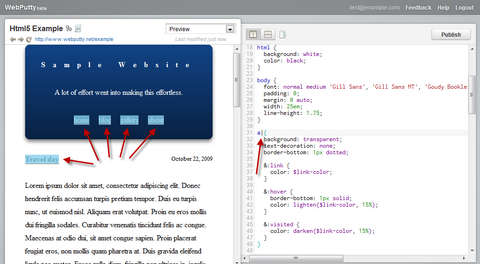 This makes learning LESS a breeze, and if in doubt, lets you fall back to CSS. The most powerful thing SimpLESS does: Save your *.less file and, BOOOM, SimpLESS generates a 100% valid standard CSS document out of it. No further steps, it’s that simple. 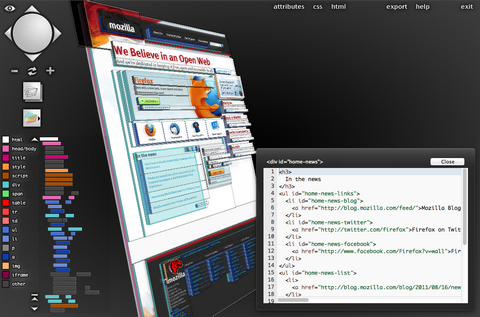 Tilt represents a new way of visualizing a web page. This tool creates a 3D representation of the document, with the purpose of displaying, understanding and easily analyzing the DOM. It will take advantage of the great tools Firefox has to offer, as it is an extension which contains a WebGL implementation, providing rich user-experience, fun interaction and useful information, while taking full advantage of 3D hardware acceleration, GLSL shaders and what OpenGL ES 2.0 has to offer. The implementation consists of a Firefox extension containing a 3D representation of a web page, as both a fun visualization tool and a developer-friendly environment for debugging the document’s structure, contents and nesting of the DOM tree. Various information besides the actual contents will be displayed on request, regarding each node’s type, class, id, and other attributes if available. The rendering will be dynamic, in-browser, using WebGL and GLSL shaders. At Browserling, they are huge open-source fans and they have open-sourced 90 node.js modules! All written from scratch. You will find the complete list of all the modules together with their brief descriptions. They have also published all the modules on GitHub, so that you can keep track of them easily. All of them are greatly documented so just click the ones you’re interested in to read more and see examples. Codecademy was created when Zach got frustrated with learning how to program. For years, Ryan taught Zach the basics of HTML and CSS, but books and videos didn’t help. 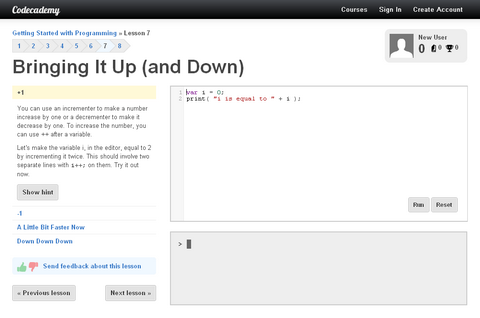 Ryan and Zach teamed up to create Codecademy, a better, more interactive way to learn how to program. Learning with Codecademy will put you on the path to building great websites, games, and apps. You can also Keep track on your friends’ progress and make sure you’re learning more – faster!